Second Street in Wyalusing crosses Route 6 at the intersection containing the Dandy Mini Mart on the south side and NAPA Auto Parts on the north side. 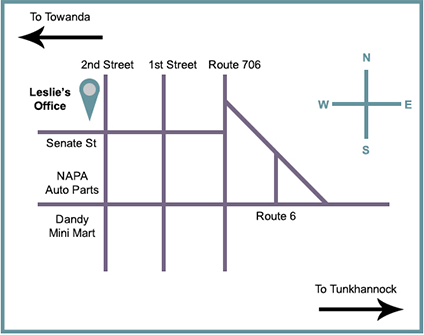 Leslie's office is located on the left side after the intersection of Second Street and Senate Street. Coming from the east; Wilkes-Barre, Tunkhannock, Meshoppen, Laceyville:Traveling west on Route 6, upon entering Wyalusing Boro, make a right hand turn on Second Street. A Dandy Mini Mart will be on your left and a NAPA Auto Parts store on your right. Go down two blocks and Leslie's office will be on your left. Coming from the west; Athens, Troy, Burlington, Towanda, Wysox, Standing Stone:Traveling east on Route 6, upon entering Wyalusing Boro, make a left hand turn on Second Street. A Dandy Mini Mart will be on your right and a NAPA Auto Parts store on your left. Go down two blocks and Leslie's office will be on your left. Coming from the north; Warren, Le Raysville, Stevensville, Herrick:Travel south on Route 706 to the Route 6 intersection. Make a right on Route 6 (west), and a quick right on Second Street. A Dandy Mini Mart will be on your left and a NAPA Auto Parts store on your right. Drive down two blocks and Leslie's office will be on your left. Coming from the south; New Albany, Wilmot, Terrytown, Dushore:Take either State Routes 2010, 2011, or 2009 to Route 187. Cross the bridge into Wyalusing and make a left (west) on Route 6, approximately one mile, make a right on Second Street. A Dandy Mini Mart will be on your left and a NAPA Auto Parts store on your right. Go down two blocks and Leslie's office will be on your left.